ok I’m getting a lot of questions about the N20 timing chain noise and replacement,,,,here are 2 short audio clips,,,,you can here a high pitched whine in both videos. one video is at 3000rpms,,,,and the other is reving the engine up and down,,,I sent both videos to BMW to get approval on the timing chain repairs. 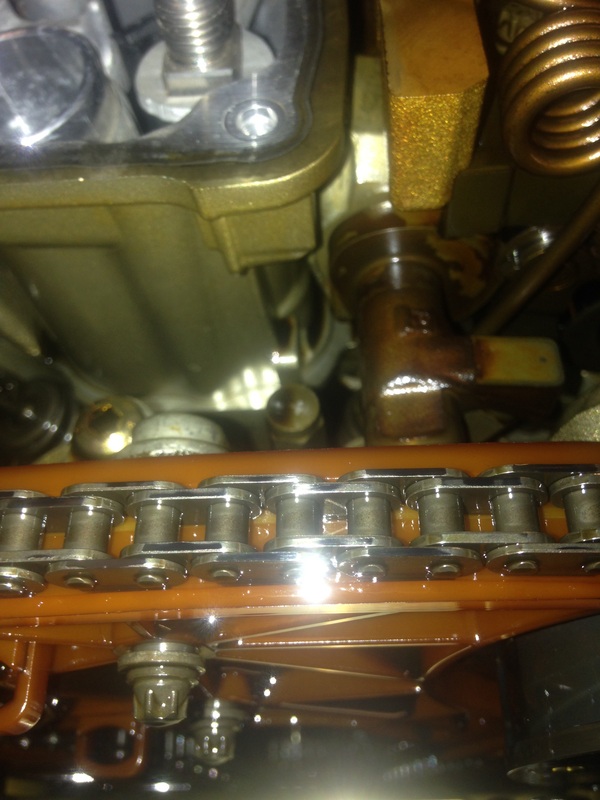 Here I removed the valve cover and inspected from the top of the engine for any visual problem,,,I don’t know if you can see it in the picture,,,,on top of the chain you can see shiney marks,,,that is an indication the chain is rubbing on something,,,,those marks are not normally there. Here the old timing chain and guide reins,,,the guide rails were broken. Here you can see where they broke,,,,the two rails would normally be snapped together. 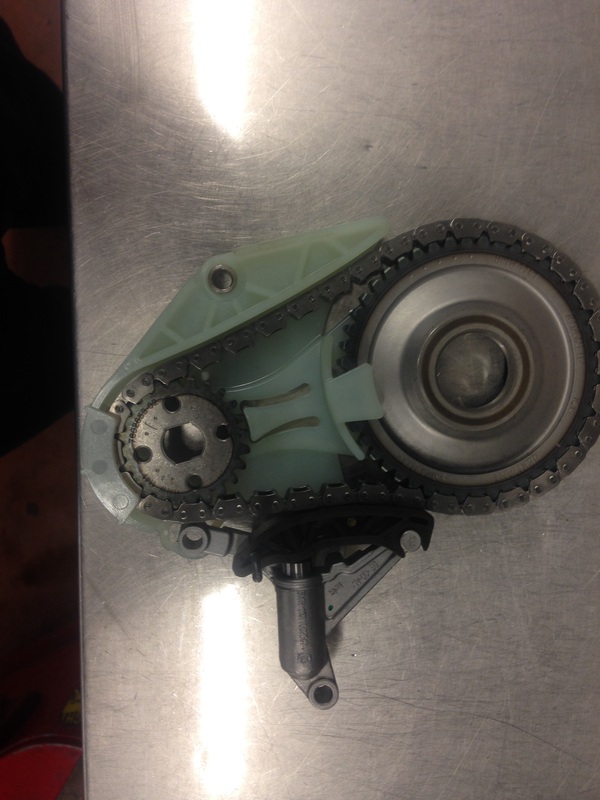 Here the old oil pump timing chain module,,,,this comes complete as you see it,,,,did not find anything wrong with this,,,but BMW wants us to replace it at the same time as the timing chain. 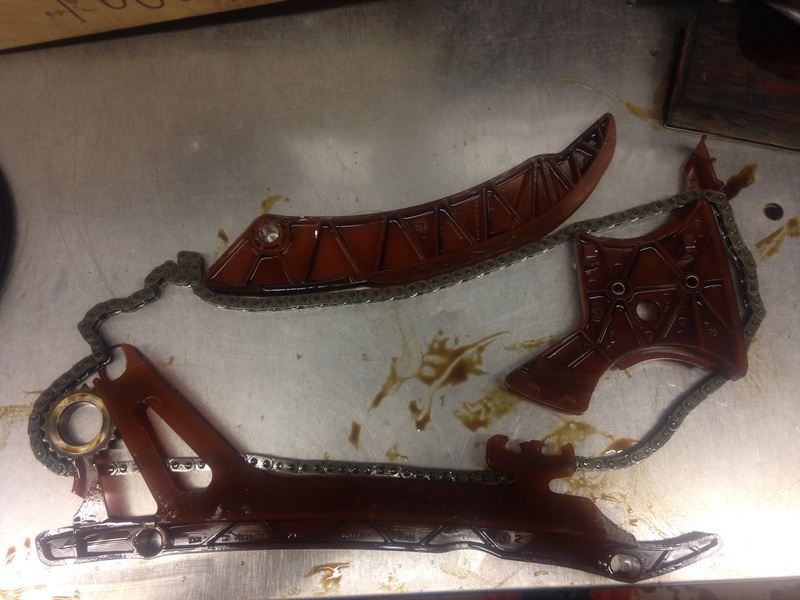 Here are the new timing chain guides and rails,,,the new ones are white in color and made of a better plastic we hope,,,,lol. This is the new oil pump timing chain module complete just bolt in,,,,this job is not one of the best to do,,,,this was on a X3 so I had to deal with the front axles and front differential,,,,,this job only pays about 9.5 hours,,,so you pretty much have one day to complete the job to make any money.,,,I hope this helps some of you guys about the timing chain issues. This entry was posted in Uncategorized and tagged N20, noise, timing chain, whine. Bookmark the permalink. By the way Car was on 148608km.. and never had any motor issues. serviced on time and everything done by the book.. first brakedown owned car since new. I have an 8/2014 built X4 (2015 F26) with the N20 motor and the timing chain is just ridiculously slack. No whining sound and no shiny marks, but only 15K miles on the odometer. It is my understanding that BMW has a procedure (11 31 540) and a special tool (2 411 399) to check an N20 engine for possible elongation of the timing chain. Is this something “any” BMW dealer can handle and how long (a.k.a. how much) would it take to do this test? Hi (again). One time, and only the one time, I could lift the chain about 1 cm with my fingers. But except for that one time, it has been tight whenever I checked it. Someone stated that this slack can be a function of exactly where the motor stopped. The TC tensioner only “works” when there is oil pressure, right? Changing the tensioner is a simple DIY job, it seems. I noticed that the part number and physical appearance has changed for the tensioner. Would you recommend changing the tensioner to new part number as a preventive measure? In a related matter, VW/Audi has recently reached a class action settlement for timing chain and tensioner failures in 2008 to 2014 vehicles with 2.0 turbo engines. The extended warranty is for 10 years/100,000 miles and also covers earlier repairs. It’s easy to check these parts before engine failure, either visually by opening a cap on the timing chain cover or by doing a reading from the OBD. Yes, I have an A4 that is now covered, and I also have an X3 with an affected N20 engine. FYI, 2013 X1 sdrive28i with 37k miles. Yes you have a slight whine from the timing chain,,,,,,the UFO sound I would have to hear more of it,,,,could be the to much vacuum inside the engine causing a whistle noise from the front engine seal maybe. Thanks, Andreas. Do you think I would qualify for the timing chain replacement under ELW with this level of whine noise? Or should I wait a bit before taking it into the dealer to see if it worsens? I’ll try and take another shot of the UFO sound. Kind of sounds like its coming from the harmonic dampener. I would try now with the dealer and see what they say about the whine noise,,,,,if that UFO noise is coming from behind the harmonic balancer then it is your front crank seal that is going bad,,,,but your valve cover could be causing the front crank seal to go bad with too much internal engine vacuum. my car sounds very similar to this. it does have a rattling sound on cold starts. when it is on operating temperature, the rattling sound goes away. however, i do hear it towards the end when i rev and release the pedal. on the possible vacuum noise, is this something related to a P1290 code? i don’t have a bmw-specific scanner but what i’m reading on the web is that this code is possibly a vacuum leak. appreciate your thoughts on this. thanks in advance. I’m not familiar with P codes,,,,but you said you hear a vacuum noise,,,you old check the intake and turbo charge pipes,,,also on some N20 engine with a vacuum wastegate their are some vacuum limes connected to engine cover and the vacuum pump at the rear of the cylinder head. Big thanks for the info that you provide here! I had timing chain and oil pump drive chain replaced on my N20 engine. After this work, I started to here new buzzing/whirring noise from inside the car. It is best heard on small speeds and RPMs around 2000. This noise changes with RPMs and it sounds like a small electric engine that follows the RPMs, but lags behind a bit. What bothers me more is that there are metal particles in the oil after this work (it was new oil). After that the oil was changed, and there are again metal particles just after around 200 miles. I know it is hard question, but can you imagine or suggest what could go wrong during such work and what should be checked? Did you find out what is the reason of this buzzing noise? The TSB doesn’t list 228i’s but I’m assuming the n20/n26 have the same issue? I plant to get a X3 Feb2013 tomorrow but i just suddenly read this from you. The car is already 130.000km so I wander is there any way i can prevent this problem or buying Extended BMW Warranty cover cost in case this problem happens? It really costly (~6-7000CAD$ for 24mnths with 40.000km). It is worthy? That’s a lot of money for only 24 months and 42k kilo extended warranty,,,,I don’t know if it is worth it,,,,and the car already has a lot of kilometers .,,,was there any work done to this car already? Thanks for replying. Im not someone ưho really understands about car so i dont know. I bought this from Bmw authorized dealer in ottawa. Should i get extended warranty? If not, is there any way i can prevent timing chain problem ? I allow myself to reply in order to share my experience 🙂 .. In my case, in Summer 2016 i bought a 320i with an N20 from April 2013. Car had 3 years at that time and 109000 kms on the counter. It had the timing chain issue which was gladly covered by the BMW Europlus warranty for pre owned cars. In my case, the issue was that timing chain rail was broken, falling the pieces down into the oil sump and blocking the sucking pipe of the oil pump. So i reached to know the issue just by chance. In my case there was also a broken bolt which made a whole in the block resulting in the need to change also the block. In total, i believe 9000euros which were covered by warranty. In order to give you some figures I paid 20000eur for a 320i with 109000 kms and quiete a lot of extra options, 3 years old, warranty included in an official BMW dealer in Bünde (Germany). I don’t know how much are you asked for the car, but definitely i would not buy it unless i would have a 100% warranty which covers whatever thing. And also definitely i would not accept some thousands extra (dollars or euros :-)) just for the warranty extension. The car is 17.000$ CAD ALL IN with 130.000km on it. I accidentally made deposit on it 1000CAD but i dont have budget to go for other vehicle in their inventory. I plan to buy extended warranty with them ( Elite BMW in ottawa – official dealer iguess) with around 5-7000 $ CAD. Cover up to 24months and 20-40.000km. 1. Get car and 5k for warranty. 2. Get car only, ask them to replace the timing guide( as i understood the main cause of n20 engine problem. They will not chane it unless it broken). So i have to change it now with my own money or wait til it broken. 3. Keep 1000$ there and hope to find better car and my whole family has no vehicle for months. If i keep money there and look for X3 model, what year and model i should avoid? Hi Lucas, for half of that money you could have the chain guides fixed and won’t need to worry about it any more. Thanks guy so much. But extacly what i need to replace? And where should i do it? Idian store or Bmw authorized service centre ? I wonder 50% to cover that problem but with the rest50% can cover anything come up bumper to bumper for around 2 years. It might be great right? 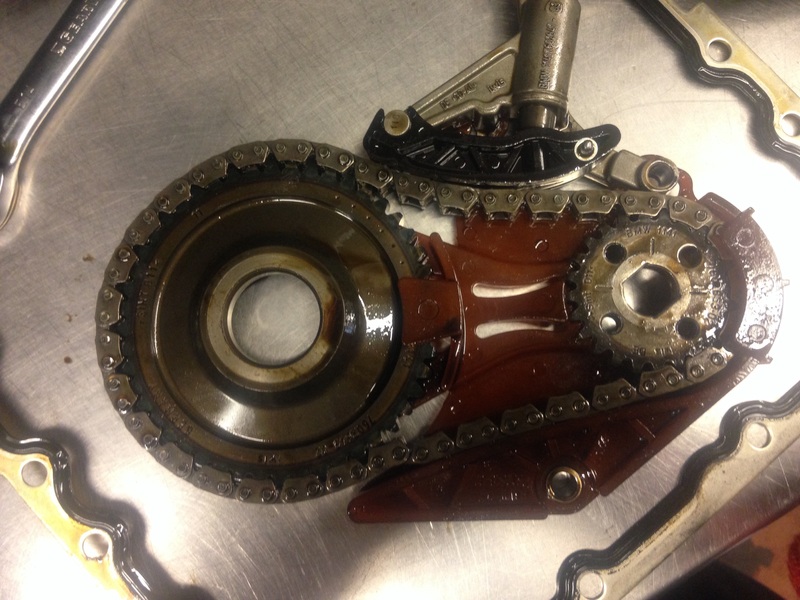 Hi, i have just had the timing chain replaced today at 52k miles on a 2013 320i x drive auto. Was getting similar whining sound with the revs as in above videos… BUT the noise is STILL there!! It’s the same. ANY ideas please?? You might still hear a slight whine noise which will be normal with the new timing chain and rails. Hmm ok, are there any videos for what ‘normal’ should sound like? Thanks bud. Yeah I realized all the magic happens inside the VANOS unit themselves as all the feed ports and valleys exist inside the center bolt of the VANOS, with only one main feed from the center of the camshaft. I did have to reset adaptations however. It started to set camshaft obstruction codes, and reset took care of the issue. Nice glad to here that. Hi, if the whine is still present after timing chain replacement- is the next thing to change the oil pump chain? If so, would the oil pump also need changing? Also I am getting quite a bit of smoke from the exhaust on a cold start, is this related? stretches out and the chain links seize which does not allow smooth running of the chain on the sprocket. There is a danger of chain snapping. Oil pump does not have to be changed. It is a major job as the front cross member has to be dropped, the engine suspended to be able to remove the sump. Special tools are needed to loosen the oilpump bolt. Normally the engines timing chain and oilpump chain module are replaced at the same time because now the rocker cover has to come off again and camshafts have to be locked in place once again. Hi just to update, changed the oil pump chain as advised and the whine has disappeared finally! Hello Andreas! Thank you for all this detailed information and also for helping people out! Could i please ask you to watch 2 videos of my car and help me identify if my chain is starting to give up and also maybe explain what that wierd electronic WIRR sound is? Car has run for 112000 km (nearly 70k miles) and serviced accordingly to BMW’s schedule. Thanks for the videos,,,ok I hear some timing chain noise when you rev the engine,,,now the other video during idle I have never heard that noise before,,,,can you remove the drive belt and start the car and see if the noise goes away,,,,sounds like a electrical whine noise possible the alternator making the noise,,,,,so I want to see if the noise goes away with the belt removed. Hi! Thank you for helping me. Now unfortantly i absolutley have no clue how to remove the driving belt and since i not very good at mending cars. Im afraid i would just brake something. Here in sweden most BMW are diesel but since i drive very short routes with lots of start and stop i was afraid the particulate filter of the diesel would get glogged up so i got myself the petrol engine instead, knowing nothing about the timing chain problems. I hoped i could keep the car for a few years but if the chain is prone to breaking unexpectedly then im afraid im going to have to sell it which breaks my heart since our whole family loves the car. 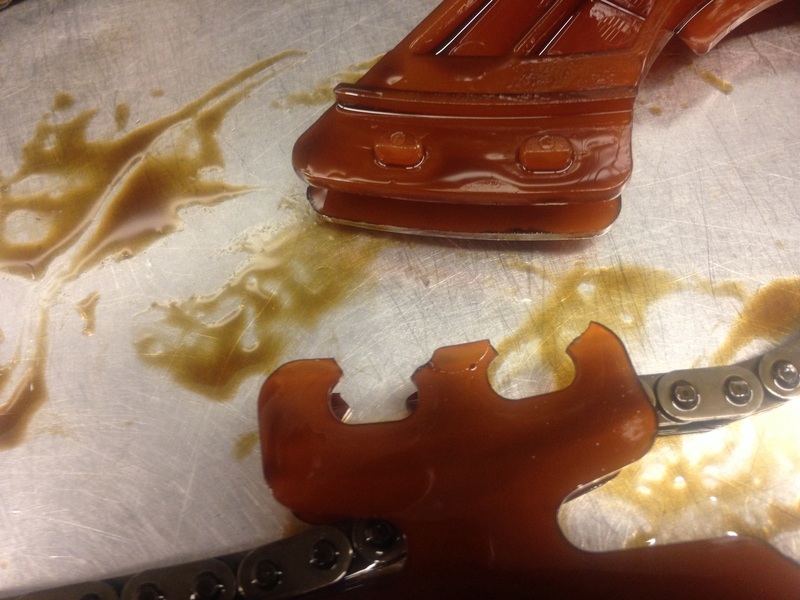 I know you have seen or heard of many more of the timing chain problems. Has BMW been able to come up with a definite time line or portions of their production that may experience the timing chain problem or is it more like all of the N20 engines could have the same problem from 2012 forward? I guess I am wondering if there were batches that were good during this time frame. Kind of concerned about buying another BMW if they in fact knew they were installing a potentially defective part. I read the lawsuits and it implies they did but offers no proof. The problem N20 and N26 are up to 2014,,,,2015 and later no problems at this time. Is BMW looking at ranges of VIN numbers or engine serial numbers (?) to determine if there is some range of production numbers that had the problem during the 2010 to 2015 years and other ranges that do not have a problem. Seems like the dealers see some and would report to BMW if it is still covered. Just so hard to believe that all are going to go bad if the engine is an N20. Do you anticipate that they will publish the ranges or if we got the letter, we are in the specific ranges? I guess what I mean is do they narrow the range as they obtain more data? Thanks for all your help. Did the broken rail causes the engine to rattle louder on D or R when stationary? Im getting my oil pan gasket change in a few weeks since they are leaking abit, hopefully wont be seeing anything that belongs to the engine. On the otherhand, coming from polymer industry, Ive seen alot challenge that the old rail were white once and turn orange over time, plastics do turn yellowish overtime due to degredation, it is a result of polymer chains breaking down which is what we will see in aged plastics, yellowing headlights or in our case the timing chain rail. However, it will not turn orange even it is summerged in oil. I do believe BMW revised part to uncolored for a reason. Adding pigments into any plastics reduce the melt flow of the material which results in decreasing the mechanical properties of the materials. The revised uncolored rail suppose to last better. 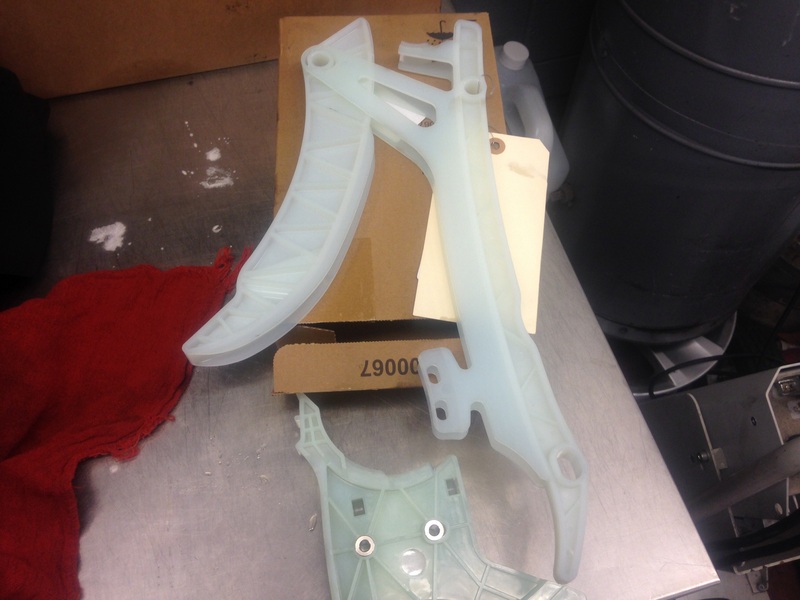 Adding pigments into plastics causes the pigment to break down polymer chains during the injection molding of the part or extrusion which is a 2 step process(color compounding), when I say 2 steps it means 2 heat history applied to the material to further degredates the materials. P/S: The “white color” of the rail is the virgin color of material, I haven’t touch them in person but I strongly believe it is made of unfilled Polyamide. Hi, I’ve just acquired a 2011 X1 xDrive 28i with the N20 engine. I’ve been following this issue online and so far I have no whining sound to report. Is there anything else I should look out for besides that noise? What is the recommended maximum mileage between oil changes? 15,000 miles? Each vehicle is different,,,now BMW has changed the oil changes from 8k to 10k depending on which engine. I filmed my timing chain and the sound during acceleration, what do you think? I check quite often and sometime it’s very tight, sometimes it moves a bit like in the video. Is this level of play normal? I hear some sort of “whine” but not as loud as in the videos you posted about. Is this normal too? Another question about noises. We have a 2014 X1 with low miles (25,000). As I drive up some moderate hills at low speeds but in a lower gear, I hear a whine. It has done it since day one. I’m saying around 30 miles per hour and still in third or fourth gear. Is that the tubine that makes a pleasant whine? Mine is 2014 x3 with 52k miles. No issues so far and I like the car. Would you recommend to get rid of it if nothing happens before warranty runs out at 70k or shroud I think about replacing those assys? I’ve done quite a few repairs myself on bmw’s but it looks like this job requires a few special tools. Would appreciate any reply. Thank you sir…. that’s what I was leaning towards… unfortunately.. Seems like it’s almost impossible to keep more or less modern BMW for more than 100k miles …. Hope keep my 2009 128i for more than 200k though…. Would you keep it if this issue was resolved during warranty….? You know that someone will buy this car if you sell it. If BMW has a problem with every car that they put this chain in, BMW has a really big problem. There will be multiple class action suits especially if they continued to install the chain after knowing they had a problem. I own a BMW and it was my first. It is also my last. This is not an acceptable response from BMW (70,000 mile warranty extension) if in fact all cars will have the problem eventually. From this point on, a BMW will be nothing more than expensive overpriced junk. Sorry to vent but I am pretty sure others feel the same way. MY 2012 528i 2.0 is now exhibiting high pitched whining and I have 86k on the clock. Trading in the vehicle is not an option and I’m on a tight budget. What is the absolute least amount of parts I can get away with on this repair? A very close friend runs a general indy shop and charges me around $70 ph of labor. If you have it done KEEP YOUR RECEIPTS. There are several class action suits either underway or will be soon. At a minimum I would expect exiting of 10 years or 100000 miles. Google N20 bmw lawsuit. Yes there are a lot of special tools,,,camshaft blocks,,,pin tool,,,also tool to hold flywheel,,,,you need engine support because you have to remove the subframe from the car,,,,it is a big job not a easy one to take on in the backyard. Thank you so much for your excellent technical information. I have a 2014 X1, 08/2013 build date with the N20. 109k miles and I don’t think I hear the noise. Inspected the chain and am not seeing the shiny wear spots, so fingers crossed. I do have an inexpensive bore-scope that Bluetooth’s to my phone. If I snake it down the front of the engine, what would I be looking for? Also, probably unrelated, but I am getting occasional partial power mode, especially after filling up with gas. Fault codes are 2CAA electric wastegate learning stop outside tolerance, and 2C58 charging pressure control deactivation, pressure build-up blocked. Thanks for your help! Thanks for the reply! Replace the wastegate, or wastegate actuator? Sorry to ask one more question, but as I understand the wastegate system, there’s an electronic actuator that moves an arm that pivots the wastegate valve inside the turbo housing. If it’s the wastegate that needs to be replaced, doesn’t that mean the entire turbo unit has to come out and be replaced? The electric wastegate actuator would seem to be the more likely thing to replace. I won’t post any more on this thread. Sorry for the hijack, and many thanks for your help! Don’t worry about posting,,,,you can post as much as you want,,,,maybe I wasn’t clear the electric wastegate that has a rod attached to that’s one you want to replace first,,,,hopefully it’s not the turbo. Hey, here is another video. Sorry I didn’t have anyone to film. The phone is just sitting on the passenger side of the engine bay. If you need I can get you another video on a less windy day. Let me know if this is a little better or not. Thanks for the great help. Thanks for the video this one is better,,,,yes I can here some whine noise from the engine,,,,if you take the tune off the dealership should still be able to work on it. I’ve got a 2013 328i xDrive (62k miles) coming out of warranty soon and the timing chain issue has been a concern of mine. Not covered under ELW (Canada). I’m not sure how much life is left as I believe there’s a slight whine and some notable scoring. And whether or not they would replace on warranty at this stage. Your blog has been very informational thus far. Any input appreciated. Thanks for the video,,,yes you can hear a slight whine,,,how much life you have is hard to say,,,have you talked to your dealer about replacing the timing chain and oil pump chain because of the whine issue? Appreciate the quick response! No my last contact with them was maintenance and an inspection but it didn’t flag this nor was it on my radar at the time. I will do so now. In the video when the RPM comes back down is that secondary ticking sound abnormal? I noticed I didn’t hear it in videos of others. Almost sounds like a sprocket wrench. There’s no way that’s a normal engine or turbo whine is it? Dealer didn’t acknowledge it as timing chain whine. May try a different location. Hi! I’m looking to buy a used 328i and hear a lot of ticking but I didn’t test for the whining by revving it. However, I looked up the VIN and that car isn’t covered with the ELW. Does that mean it’s not affected? It’s a 2013 XDrive with 60k miles and seems to have been manufactured in Germany. Hi. Thanks for all the information you provide. “There’s a possibility that car is not affected,,,but me personally I would stay away from that car,,,,” Do you know what exactly causing this problem? I mean if some cars were not affected even though they were built during those years does it mean that BMW aware that there was a batch or a few of defective rails or chains used during engine assy? If that’s the case then BMW definitely was able to track down the root cause, and by s/n’s of those parts/batches identify how many are in the field and their p/n’s or whatever logistic system they use. BMW put out that list of years and models that they think are affected by the batch of timing chain rails were bought during a certain time line,,,,now not very timing chain rail goes bad,,,we do not know what causes them to go bad and which ones have no problem at all,,,,this whole thing is just the luck of the draw,,,,me personally I wouldn’t like to take that chance. Hi BMW Tech, this timing chain issue is of great concern to me. Recently a poster on the attached thread(post#122) has a photo of the two tabs that broke off first, and the photo shows that the location of those tabs are very close to the opening of the intake camshaft sensor(the green dot) . Is it possible to remove the intake camshaft sensor, and then insert a borescope with a 90-degree mirror up that opening to examine the clip on tabs? Do you think I can go dealer service bay and ask for a borescope inspection through the input camshaft sensor opeing? The only way to check out the timing chain rails would be to remove the valve cover. Update to my original post: As my 2013 F30 is now at 69k miles and due for an oil change, I tried to get the dealership to warranty the TC repair. They initially refused to send a video of the sounds to BMWNA stating they couldn’t hear anything. After I pushed further, they agreed to have the local FSE (field service engineer) from BMWNA take a look at it when he comes to the dealership once a month. Unfortunately, he too stated that there is “no high whine to indicate failure, that the scoring on the chain is normal wear and that the engine is performing as expected and normal” and that they won’t authorize any work under the ELW and SIB 11 03 17. Since the ELW expires at 70k, my only option is to pay for it out of pocket or sell the car… I will probably sell it. Hi,this is Victor from Mexico,when the timing chain brokes,is there a posibility that the valves damage? Hello bmwtechnician I have a 2013 BMW X3 with N20 engine is this whining noise a timing chain issue? Thanks for the reply, will replacing the timing chain tensioner help the whining noise? Hi Andreas, I need some advice. My 2014 320i (with N20) has a little over 38,000 miles. It has been mostly trouble free besides some initial issues. If you were in my position, would you trade in this car for something else? Should I just keep driving it, hoping it reaches 200,000 miles mostly trouble free? The reason I ask is that I am selling my other BMW, an old E46 and potentially looking to replace it. I am either going to sell the E46 and just keep the F30, trade in both and get one new car, or just trade in the E46 (keeping the F30) and get an inexpensive CPO VW as a replacement. Any thoughts? Asking the 320i N20 engine to reach 200k miles is asking a lot,,,I would just move on to a new car if you can. Have a 2013 528i xDrive (108k miles) which came up with the Drivetrain Malfunction error and loss of power about 2 weeks ago. Brought it in for diagnosis and it came up timing chain stretched. Dealer wanted $4800 to fix the issue. I called them back to haggle the price and the service advisor said he would ask the manager about it. He called me back later in the day and said they took another look at it and said it was not advisable to do the repair as there was sludge in the engine which might cause more problems down the road. He also said engine replacement wasn’t worth it so it would be better to just get a new car. Will talk to him and go to the sales department tomorrow to see what I can work out. Yes if there is sludge in the engine then it’s not worth it,,,,they can show you the sludge is you might get a better idea on what’s going on. Thanks so much for all of your help and information provided on the blog! Wondering if you can hear any whine on this video? Engine is warm, seems more noticeable at startup. Also, in doing the TC repairs have you seen any chains “skip” timing? So, what the dealership said was a timing chain failure (BMWNA was going to cover all but $1,600) for my 2013 X3 w/ 70,800 miles on it, is now a blown engine (dealership diagnosed it as timing chain, then when they dropped the oil pan, they found parts in it), with parts in the oil pan (I have a pic but don’t know how to share it here). They say the parts are “magnetic” which I think they mean “ferrous,” and there are obviously pieces of the timing chain rail guide in there. Now, they want to charge me $7,706 to replace the engine. Compared with similar stories costing $22,000, that amount isn’t bad, but I don’t have $8k lying around… no idea what I’m going to do. Anyone have any idea what to do here? I’m at a total loss…. I’m sorry I don’t have any ideas for you,,,hopefully some else has a idea for you. It’s gonna sound crazy but you can do what I did. Twitter. Tweet @bmwusa and just complain about it. You might be surprised. I know I was. I got my 2013 BMW X3 28i. If you have a chance could you please watch my video to see if you can hear the whining sound?